SCLS and Blood Bank. Available vacancies are in DHFWS Howrah District is Laboratory Technician, Counselor, Senior Tuberculosis Laboratory Supervisor and Technical Supervisor Jobs. Selection for this Lab Technician, Counselor jobs of DHFWS Howrah District will be based on Merit in educational qualification short list is prepared. They are only called for certificates verification and interview. Last date for submission applications to DHFWS Howrah District is 17-05-2017. 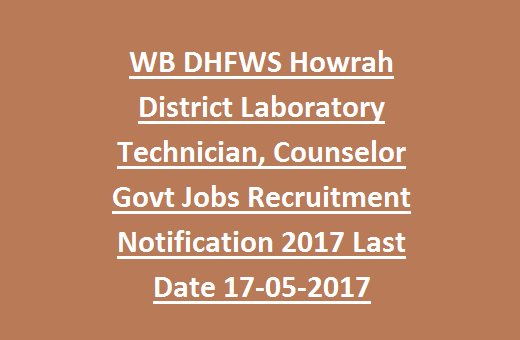 There are total 36 vacancies available in this DHFWS Recruitment 2017 of Howrah District. For more details regarding this DHFWS Recruitment of Howrah District see the below given details. Last date to reach the application to DHFWS CMHO Howrah District is 17-05-2017. There are total 36 vacancies available in this District Health and Family Welfare Samiti. For all the posts upper age limit is 40 Years. For Lab Technician RNTCP Posts upper age limit is 62 Years. For the post of Lab Technician candidate must have qualified 10+2 with science subjects and should have completed Diploma in Medical Lab Technology. For other posts you may refer official advertisement. Selection for this Lab Technician Jobs will be based on candidates mark in qualifying exams and personal interview. Eligible criteria having local candidates can submit their application to CMHO DHFWS Howrah District Officer on or before 17-05-2017 along with the self attested documents of Qualifications, experience, community certificate, ID and Address Proof, Residence Proof, age proff, 2 pass port size photos, Experience Certificate and if any other related documents to the below given address. Application form to be dropped in Post box of below given address. 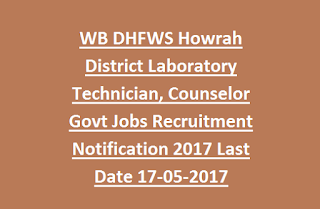 Download Application form and Notification here for West Bengal DHFWS Howrah District Lab Technician Jobs.